// Strongest pepper spray on the market. Patented 5.3million SHU. The best quality pepper spray made in the USA. 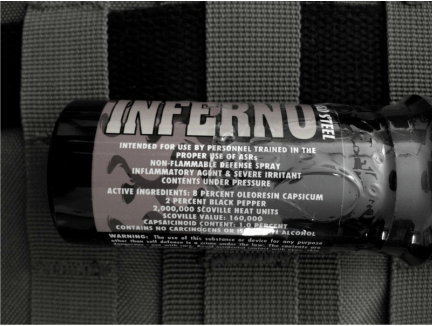 FOX labs 5.3 formula is something both professionals and civilians can rely on. // 5.3 million SHU makes it 3 million more than brands like Cold Steel Inferno! FOX labs formula is specially formulated & is one of the most potent I have ever come across. The spray is chemical based & has UV dye built in. Any ingestion will likely require Emergency Medical Services. design of the button is good. Some pepper sprays require a solid press down or it won't spray. If your finger is only pressing the edge of the button it won't deploy. FOX labs will still spray just not as strongly if pressed lightly or incorrectly. // FOX labs pepper spray formula is truly an equalizer. Whether you are physically weaker or not, using this on an aggressor will make it difficult for them to breathe. No oxygen means no ability to chase you or oxygenate their muscles & the reflex of coughing isn't stoppable. Also a hit in the face causes the person's eyes to swell and they can't see you. Most pepper sprays would be considered for self defense. FOX labs pepper spray is so aggressive I look at it as a weapon. Spraying someone continuously will completely incapacitate them and they will require medical attention. For home safety, workforce, the 4oz can is the definite choice. If you are carrying this in your purse or pocket then the 2oz is more suitable. Neither have any accessories or carry options so thought must put into how to carry it in a way that it's easy to access in a situation. Training to use pepper spray is easy as buying silly string. Practice spraying side to side while backing up. If the aggressor lunges forward practice a straight thrust kick to the lower abdomen. // For most people looking for a way to defend themselves the reality is options such as guns or knives require training and skill. Both those options are also limited by law and immediately shift the situation to lethal. FOX Labs pepper spray is legal to carry, safe to operate, simple to use & as equally powerful as any other weapon. I highly recommend this product & it should come first before any other type of self defense weapon. It's so powerful it is actually my preferred tool for defense.